Choose professional liability insurance from a company that healthcare professionals have relied on for decades. ProAssurance treats you fairly, making it easier to navigate today's changing healthcare environment, with single-source coverage that meets your unique needs. We make it simpler. ProAssurance Group is rated A+ (Superior) by A.M. Best. Just as Michigan Academy of Family Physicians is striving to build and enhance relationships amongst members, payers, legislators, state agencies, and other stakeholders as part of its 20/20 Strategic Plan, the Board of Directors has also identified the need and recognized the value of connecting with companies, businesses, and professional firms that serve primary care physicians and their patients. To put this awareness into action, is the newly launched MAFP Family Medicine Business Network—an exclusive program that provides an opportunity for companies to support MAFP, and even more importantly, to affiliate with our state’s primary care physician leaders. Finding ways to work together and grow primary care practices throughout the state are vital to caring for a population that is continuing to feel the uncertainty of what their healthcare may look like in the future. Programs, such as Healthy Michigan, are at risk, while underfunded initiatives and unfunded mandates affecting how care is accessed and delivered appears quite blurry. It will take all of us—looking through the lens of putting patients first—to figure out next steps to make America’s healthcare system sustainable for the long haul, while eliminating burdensome administrative demands that take away from patient time and maintaining the sanctity of the physician-patient relationship. No more band-aids! With the complexities inherent in our healthcare system and increasing demands upon that system, we all know the framework needs to change...or it will collapse under its own weight. It is apparent that no one entity—not government, large healthcare systems, commercial payers, healthcare professionals, pharma, etc.—will solve the problems alone. Coming together for the betterment of all is our best bet. That is why MAFP—with a membership of 4,200 strong—sees even greater value in establishing and strengthening relationships outside of our core. While we cannot solve healthcare’s macro-issues, we can do our part in coming together to evolve Michigan’s primary care network. Although our Academy’s bylaws limit professional membership to physicians, residents, and medical students who meet specific criteria, many businesses have a mutual interest in what happens on the primary healthcare scene and want to support the work of Family Physicians. 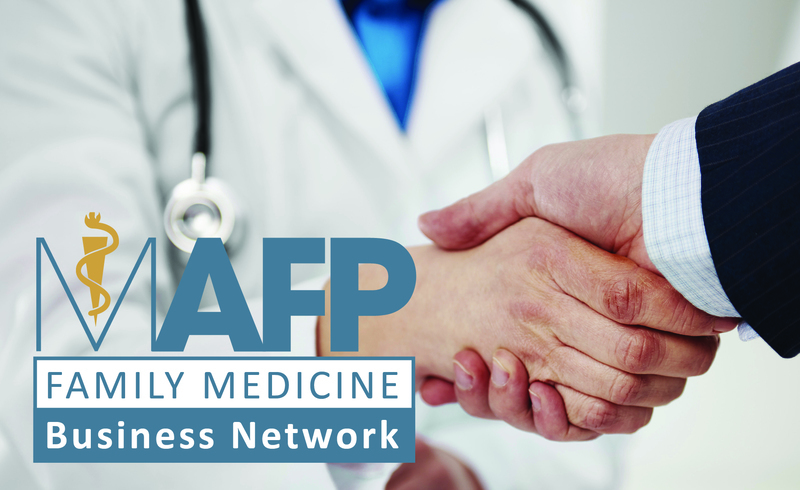 MAFP’s new Family Medicine Business Network is designed to facilitate connections, focused on building long-term relationships through more productive business practices, targeted education, and enhanced communications. Recognizing those who are making a commitment to Family Medicine in Michigan and patients across the state is paramount to the success of this program. Companies who become part of the Chairman’s Circle, President’s Society, and Affiliate Family Medicine Business Network may contribute to MAFP members' knowledge, assist them in caring for their patients, create greater efficiencies, and realize greater return on investment within their practices. While we understand not all programs and services are going to be needed by every Family Physician or primary care practice at a given point in time, being aware of what is available helps members keep a competitive edge, stay on top of changes, and perhaps think in a different way to achieve goals. We recognize that time is valuable. That’s why the goal of MAFP Family Medicine Business Network is to “be there for you” by opening doors and building relationships so that when members find themselves in need of information, products, or services, they only need to look as far as the Academy that exists to support them.